Michael McCarthy may have done it again. The chef-owner of the hugely popular Dr. Ho’s Humble Pie has a new venture that seems destined to be a hit. Giddy’s Good Fortune Take Away opens tomorrow, August 14, in the original location of Dr. Ho’s. Ever since McCarthy moved Dr. Ho’s into a newly constructed space last September, he wondered what to do with the old space next door. He ultimately settled on a counter-service joint serving his favorite kinds of food – Vietnamese, Thai, and Chinese. McCarthy has been honing recipes all summer long, and says the kitchen is ready to go. We were fortunate to preview some of the food, and agree. North Garden residents appear to be in for a treat. McCarthy’s aim with food is modest: “give the people what they want.” So, he’s not out to create new trends or change the world, but instead plans crowd-pleasing takeout classics, carefully rendered, with the occasional twist. The result is familiar, crave-worthy food. Case in point is the Pad Thai, which was spot on. “It’s a simple dish,” said McCarthy, with a simple formula for success: use good ingredients and the right technique. Also delicious were Fresh Shrimp Summer Rolls – rice paper rolls with the classic filling of poached shrimp, rice noodles, bean sprouts, carrots, cilantro, and mint, with a side of spicy peanut sauce. Other menu items will include appetizers like Chicken Lettuce Wraps and rice bowls like General Cruz Sesame Chicken – breaded fried chicken in a sweet sesame glaze, with fresh broccoli and carrots, topped with toasted sesame seeds, and green onion. Desserts are donuts — seven to an order — with a choice between “Cruller Style” or “Mandarin Style.” And, of course, fortune cookies. Giddy’s will begin taking orders tomorrow at 3 pm, and will then settle into regular hours of Tues-Sat, 11:30 am to 9 pm. Here’s a quick Q&A with McCarthy on the story behind Giddy’s. What inspired you to open Giddy’s? The inspiration for Giddy’s was really two things: one, my favorite cuisine to eat is most definitely any type of Asian – Vietnamese, Thai, Chinese. I love the flavors, and when asked where I want to eat, it is usually one of the above. And two, it seems like every shopping center in America has a pizza shop and some type of Asian carryout, so it seemed like a no-brainer. We live out here in North Garden and as much as we love it, we sometimes miss the easy access to ethnic food. 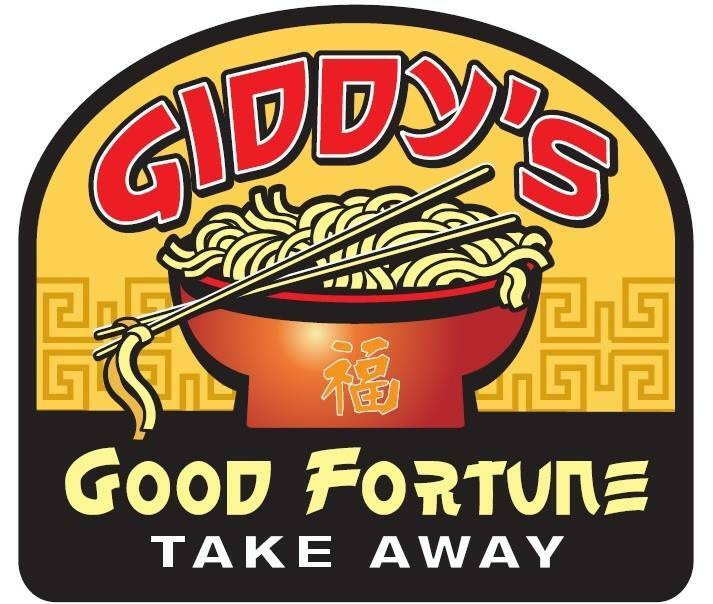 The name Giddy’s Good Fortune Takeaway came out of three things. One, our oldest son’s name is Gideon, but his nickname is Giddy. Two, it seemed like the sister restaurant to Dr. Ho’s needed an equally long name. And, three, the Takeaway part is really just to give people a hint that there are only about 35 seats, so carryout is always a good option, and there is no waiter service. Also, the adjective “giddy,” it’s how I want people to react to the food. Did you consider other cuisines? We thought about lots of different ideas for our old space, and this one in the beginning seemed totally insane, to open a second restaurant right next door to our existing one, but the longer we chewed on it, the better the idea seemed. I guess it’s kinda go big or go home. At least the notion of how to be in both of your restaurants at the same time is kind of a moot point. How did you learn to prepare these new styles of cuisines, very different from what is served at Dr. Ho’s? I have loved preparing different styles of Asian food since I was a young hungry chef living in San Francisco. I could always afford it, and it has always been interesting to me to explore a food style so different from where I started. General Cruz Sesame Chicken, G$ Fried Rice, and Roast Pork.